Protesters gather in Springfield to fight against systemic racism and poverty. The Poor People’s Campaign held the rally Monday, and a bus of Evanston-area residents attended. 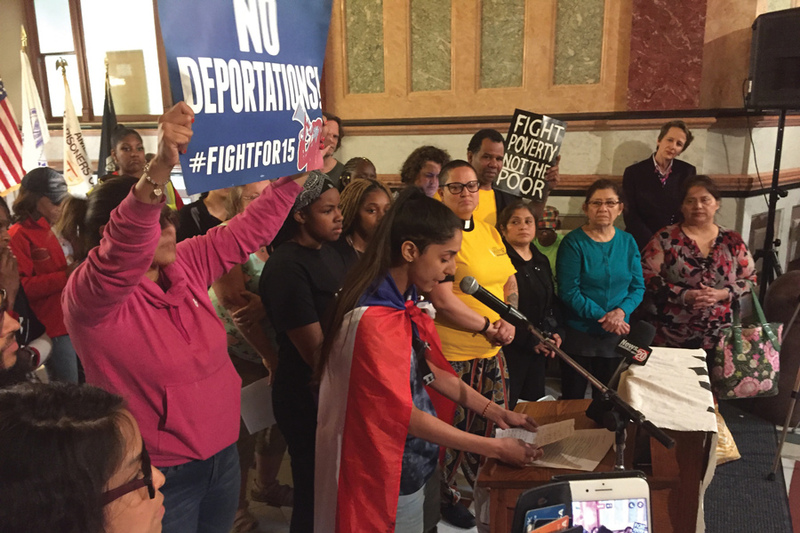 A bus of Evanston and other North Shore protesters drove to Springfield for a statewide rally against systemic racism and poverty Monday. Almost 400 people attended the rally organized by the Poor People’s Campaign — a national organization calling for “moral revival” across the country — said Daniel Ruen, pastor of Grace Lutheran Church in Evanston. About 100 of the rally’s attendees “decided to take a rest” in front of Gov. Bruce Rauner’s office in protest, Ruen said. Thirty-six attendees came from the North Shore and Lake County area, which includes Evanston, he said. Ruen said the event featured speakers who have been directly impacted by systemic racism and other issues. The Springfield rally was one of more than 30 in various states as part of a 40-day movement created by the Poor People’s Campaign. These weekly protests are tackling the campaign’s four pillars — systemic racism, systemic poverty, environmental degradation and military spending — and will culminate in a rally on June 23 in Washington, D.C., Ruen said. The Evanston branch of the Poor People’s Campaign has recently hosted local rallies to increase awareness of the four pillars in Evanston, Rev. Dr. Michael Nabors of Second Baptist Church said. The church hosted one of these rallies earlier this month. Nabors said addressing and fighting against each of the core issues the Poor People’s Campaign focuses on is the best way to work toward equity. Carmen Flores-Rance is the council president of San Lucas United Church of Christ in Chicago, which is a member of the Poor People’s Campaign. She said the most important thing is that everyone — both those more and less impacted by racism, poverty and other issues — gains awareness of and is educated about these topics. Flores-Rance said rallies and events organized by the campaign have been successful in raising local attention about these issues, a process she said needs to continue. The Poor People’s Campaign has also been fighting for the establishment of election days as national holidays, which could allow poor and working people to vote more easily, Ruen said. Ruen said he had been involved in issue-based advocacy in the past, but the Poor People’s Campaign is different because it organizes support for overlapping issues.